- Thanks to the agreement with EGP, Anheuser-Busch will purchase as much renewable electricity as is used to brew more than 20 billion 12 oz. servings of beer each year. - The renewable energy produced by Thunder Ranch under the PPA is equivalent to powering up to 50 percent of Anheuser-Busch's total purchased electricity in one year - from less than 2 percent - significantly reducing the overall emissions from its operations. - The wind energy partnership with EGP is the beer company's first contracted utility-scale project to start operations in the world, leading Anheuser-Busch's parent company AB InBev's global commitment to achieve 100 percent of purchased electricity from renewables by 2025. - Through the agreement, EGP attains revenue certainty to support its renewable energy capacity growth in the U.S.
ST. LOUIS and ROME, Sept. 13, 2017 /PRNewswire/ -- Anheuser-Busch and Enel Green Power (EGP), the Enel Group's renewables division, announced today that they have signed a power purchase agreement ("PPA"), whereby Anheuser-Busch will purchase the energy delivered to the grid and renewable electricity credits from a portion of EGP's Thunder Ranch wind project in the amount of 152.5 MW. The wind energy partnership between EGP and Anheuser-Busch will be the beer company's first contracted utility-scale project to start operations in the world, once the Thunder Ranch wind farm becomes operational, which is expected by the end of 2017. As the leading commitment to renewable power from a beer company to date, this partnership marks a vital step in delivering on the global commitment by Anheuser-Busch's parent company to secure 100 percent of purchased electricity from renewable sources by 2025. Anheuser-Busch and Enel Green Power are partnering to help grow the renewable energy market. Anheuser-Busch today signed up for enough renewable energy to brew 20 billion beers each year. 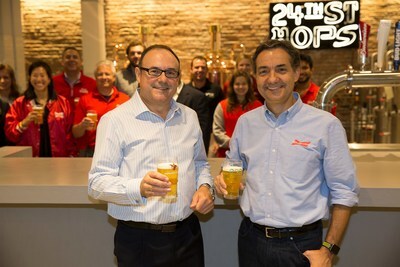 Anheuser-Busch CEO, João Castro Neves, and Enel Green Power CEO, Rafael González. "As we strive to bring people together to build a better world, we at Anheuser-Busch are dedicated to reducing our carbon emissions," said João Castro Neves, president and CEO of Anheuser-Busch. "Helping to grow the renewable energy market is not only good for the environment, it is a strategic business move as we strive for long-term sustainability. Now more than ever, we are excited to lead our company's global effort toward a renewable future and, partnering with Enel, set an industry example of how major companies can help to make a difference in climate change." "We are thrilled to partner with Anheuser-Busch, a company, which like the Enel Group, is taking great strides to help tackle some of the world's greatest challenges," said Antonio Cammisecra, CEO of Enel Green Power. "Power Purchase Agreements are an attractive model that provide not only an avenue for growth, but also revenue certainty through stable pricing. This agreement is another important milestone for our company in the U.S. and globally, once again underscoring Enel Green Power's position as the partner of choice for corporate customers, as we help them achieve their sustainability targets by providing customized renewable energy solutions, leveraging our industry-leading cost model and technology expertise." Through a Virtual Power Purchase Agreement (VPPA),1 EGP will sell to Anheuser-Busch the electricity output delivered to the grid by a 152.5 MW portion of the Thunder Ranch wind farm, substantially boosting the beer company's acquisition of renewable energy. This output is expected to amount to approximately 610 GWh of renewable energy each year, enough renewable electricity to produce more than 20 billion 12 oz. servings of beer annually. At the same time, this renewable energy output will be capable of meeting up to 50 percent of Anheuser-Busch's total annual purchased electricity, a substantial increase on the less than 2 percent currently generated by 7.5 MW of solar and wind facilities installed on-site at its major U.S. operations. 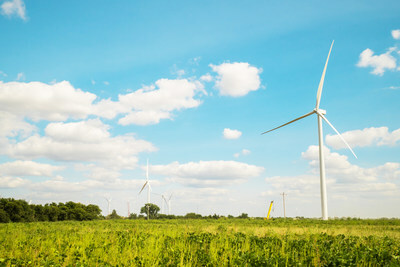 The Thunder Ranch wind farm, located in Garfield, Kay and Noble counties, Oklahoma, is comprised of two phases that total 298 MW of capacity. This project will support employment in the renewables sector by creating around 400 temporary jobs at peak of construction. Once fully operational, Thunder Ranch will be able to generate more than 1,100 GWh each year, which is equivalent to the amount of electricity consumed annually by approximately 89,400 U.S. households. The overall investment in Thunder Ranch amounts to approximately 435 million U.S. dollars, which is part of the investment outlined in Enel's current strategic plan. In March, AB InBev announced its commitment to secure 100 percent of the company's purchased electricity from renewable sources by 2025. This transition will shift 6 terawatt-hours of electricity annually to renewable sources in the markets where AB InBev operates, transforming the energy industry in countries such as Argentina, Brazil and India, and markets across the African continent. Through this transition, the company will be able to reduce its operational carbon footprint by 30 percent (the equivalent of removing nearly 500,000 cars from the road globally each year) and become the world's largest purchaser of renewable energy in the consumer packaged goods sector. The company has also joined RE100, a global coalition of influential corporations that are all committed to using 100 percent renewable electricity. AB InBev kicked off this global transformation in Mexico by signing a Power Purchase Agreement (PPA) with energy company Iberdrola for 490 gigawatt-hours per year, increasing the country's wind energy capacity. AB InBev will continue to enter into similar PPAs across other global markets where it operates, demonstrating that businesses can have a positive impact on the world by switching to renewable electricity. 1 Through this agreement, EGP will deliver the power generated from the 152.5 MW portion of the project to the grid with pricing settled by the two companies. Also under the agreement, the renewable energy credits associated with the power delivered to the grid will be acquired by Anheuser-Busch and retired from the market.